On the south western coast of Gran Canaria I rent a variety of apartments in Mogán, in the so called "Little Venice", at the beach and in the valley of Mogán. The apartments are highly equipped and appropriate for self catering and to suit all tastes because they are all privatly owned. I´m proud to say that my colleague and agency of El Sirocco has been in business since 2000 and has grown from a simple beginning to become one of the largest rental agencies in Mogán. Since January 2008 we are one team. 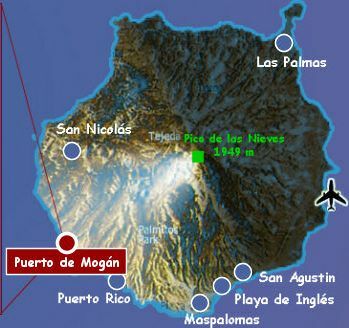 So you may contact either me in Germany or the team of El Sirocco in Mogán, we are fluent in both German and English. Also take a look at our Workshops. "Workshop meets Relaxation"! We organise and arrange individual courses in the picturesque landscape of Gran Canaria and Germany. Instructor / Therapists in e.g. Yoga, Detox, Ortho-Bionomy, etc. are more than welcome! If you have wishes or ideas apart from our offer or you need help, please call us or use the contact form.